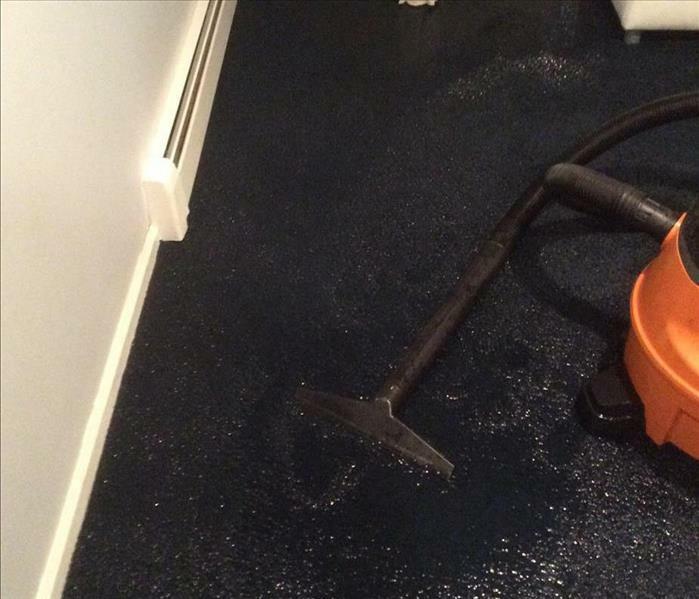 At SERVPRO of Paramus we have the latest technology and equipment to handle your dry-out needs. In this photo we have several air movers running as well as a dehumidifier. This home suffered roof damage caused by a storm that hit there home. Due to the high winds & possibly lose shingles, several shingles flew off the roof causing water to seep in to the home. We first had the roof tarped to prevent more damage from occurring followed by mitigating the interior. Here is a photo of an air scrubber we use for several different reasons but in this example we are using it to remove mold spores in the air while we perform mold remediation. An air scrubber is an air filtration system with a HEPA filter that removes particles in the air and limits cross-contamination. 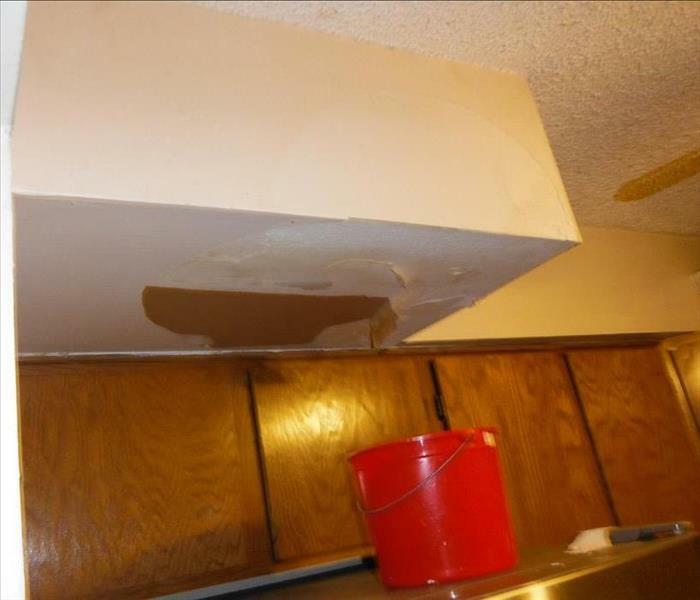 Take a look at the amount of mold found behind these lower kitchen cabinets. 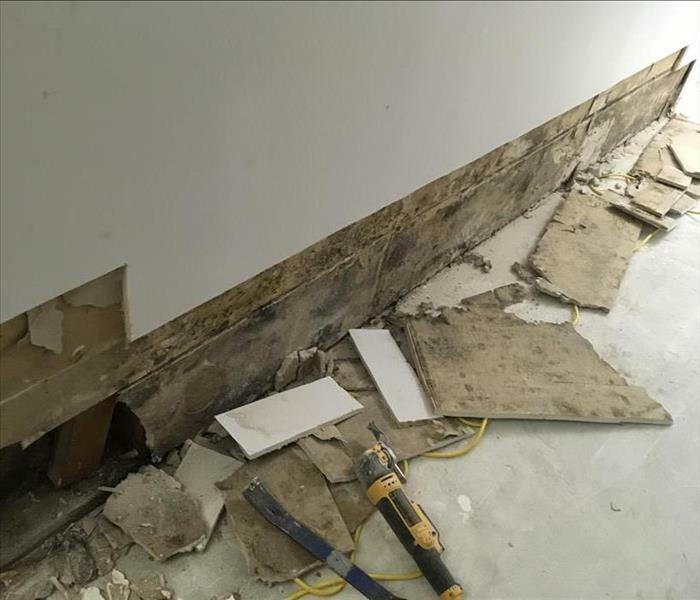 Unfortunately, it is hard to check for mold behind cabinets without actually removing them. It is common for there to be some mold due to the amount of moisture found nearby from appliances like a dish washer which can have leaky connections or pipes. That is why it is important to check the connections between these types of appliances to make sure moisture is not escaping. Local large chain restaurant in Paramus, NJ suffers from a broken sprinkler system pipe. This photo shows the main entrance to the restaurant where the waiting area for customers is covered with about a half an inch of standing water in some areas. This type of scenario doesn't allow a business to operate so we knew we need to act quickly to minimize business interruption & get them back running. This residence may look like there is not any damage occurring from an oven fire, however what you cant see is the layer of soot left on the walls, ceilings, furniture and personal belongings. Here is one of our technicians using a chemical sponge to wipe away soot from the walls. In this photo you can see the extensive damage a fire produced in this home. The attic shown in this photo is the source of the fire where the end results of mitigation left the attic bare with just its structure remaining since there wasn't much to restore. 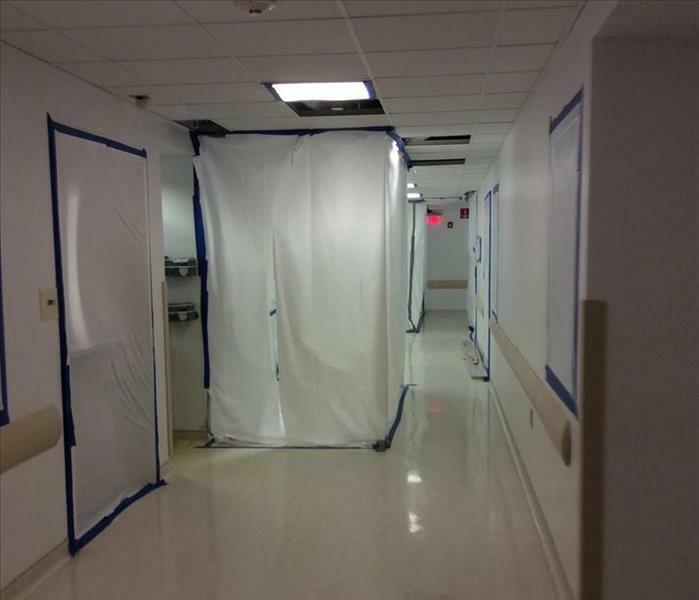 Our team using containment barriers to limit cross-contamination while performing mold remediation at a surgical center. The areas being treated are closed off to limit mold spores traveling outside of the affected area. You can see in this photo the amount of mold found hiding behind the walls at this dentist office. 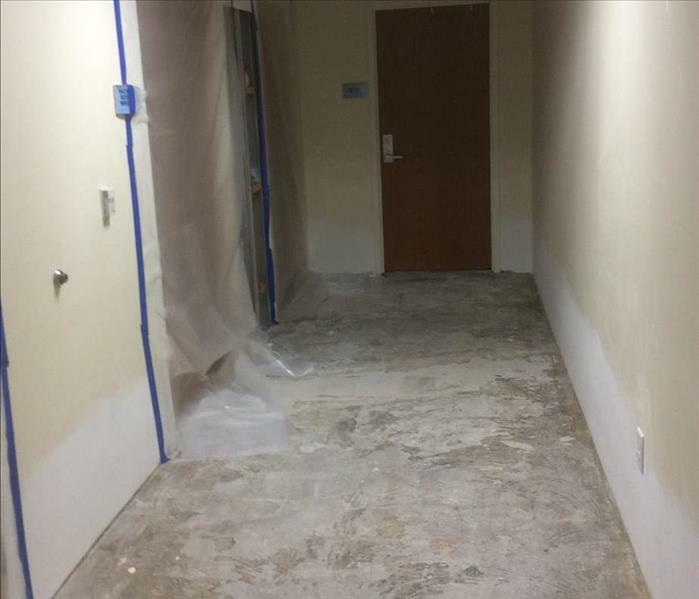 Our team removed the affected walls and treated the structure behind which included using antimicrobial solution and HEPA vacuuming. 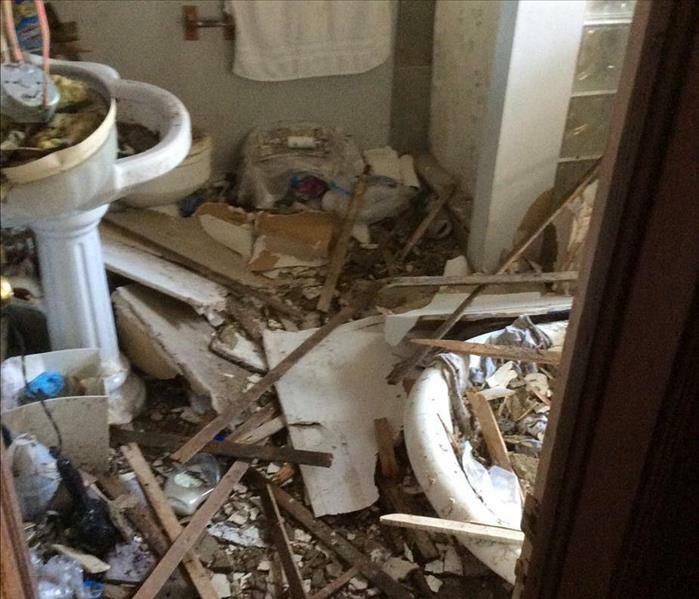 This mess is a result of a fire occurring in the attic located on the level above. This fire produced an extensive amount of damage to the home. Although it took a lot of time and effort not to mention two 30 yard dumpsters our team got it done. 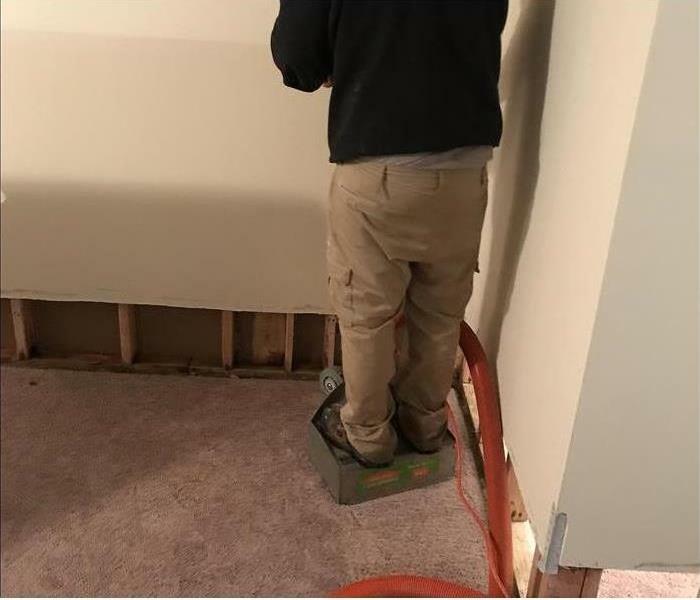 Take a look at how much water this carpet is holding on to. Here you can see the homeowner was trying to extract the water with their own shop vac but they weren't able to handle the large carpeted area with all the water it had absorbed. This is when our technicians took over with our powerful truck mount water extractor to soak up all that water before removing the carpet. 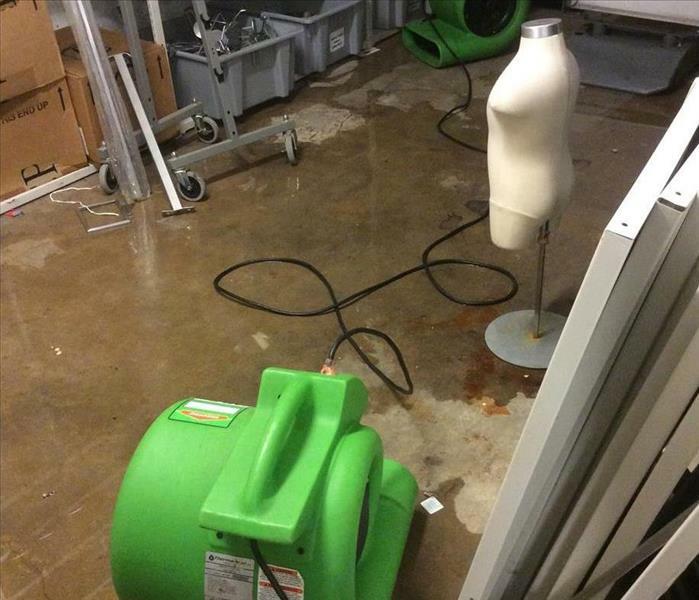 This photo shows our team using air movers to dry out the storage area of this children's clothing store. We handle not just residential damages but also commercial spaces like this one. 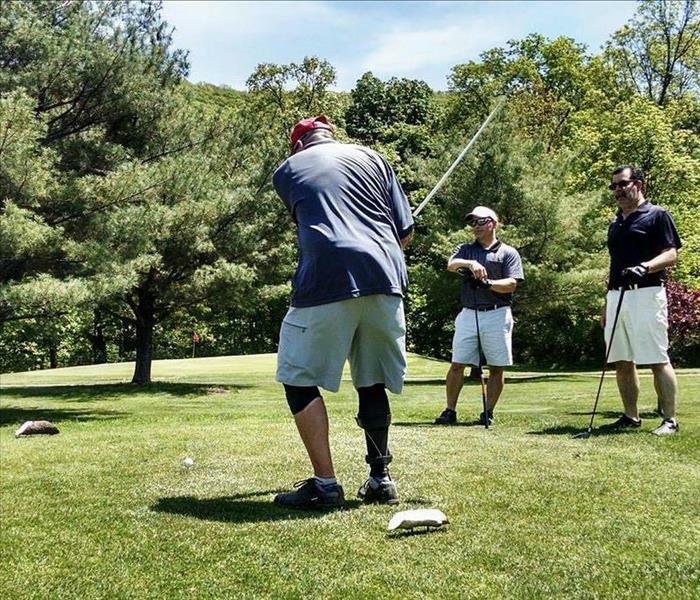 Our very own Tony D'Arco taking a swing at the Knights of Columbus annual golf outing last week. After days and days of rain prior, this day turned out to be a gorgeous one perfect for some golf. This photo shows this surgical eye center in Fair Lawn, NJ undergoing mitigation. Our team set up containment to keep the area as sterile as possible. The reason for the containment was due to asbestos found on site as well as poor air quality testing showing high mold spores count. We tried to limit any contamination with the unaffected areas. Sometimes we fall into situations where a loss site we are called to doesn't have any power for us to run or use equipment. 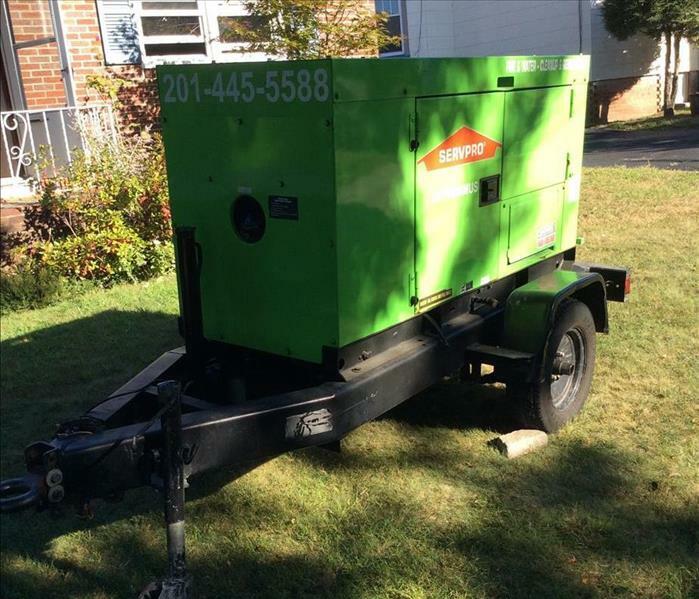 We, at SERVPRO Of Paramus, will still be able to get the job done by providing a generator on site to produce electricity to get everything up and running. Here is a photo of our ozone machine in action at a home in Rutherford, NJ. 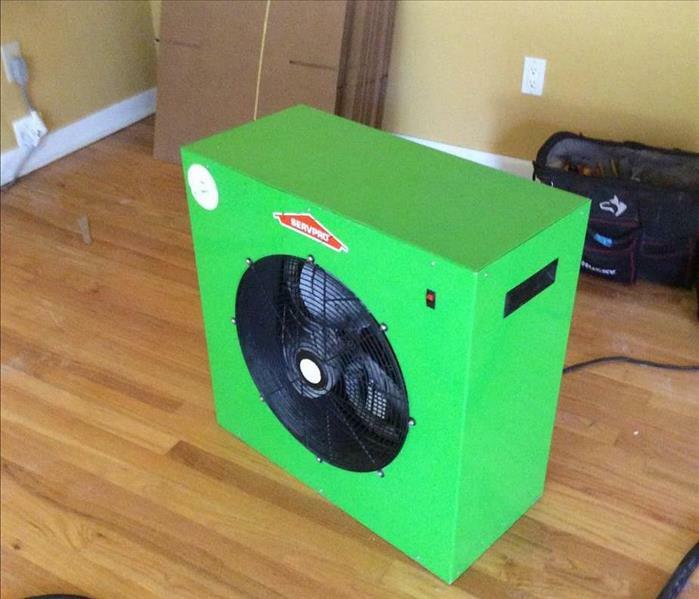 This is being used to counteract the smoke produced from a fire in this home.Ozone treatment is used to deodorize, disinfect, kill or remove dangerous or irritating airborne particles. Here is a shot of one section of our warehouse where we store some of our drying equipment. 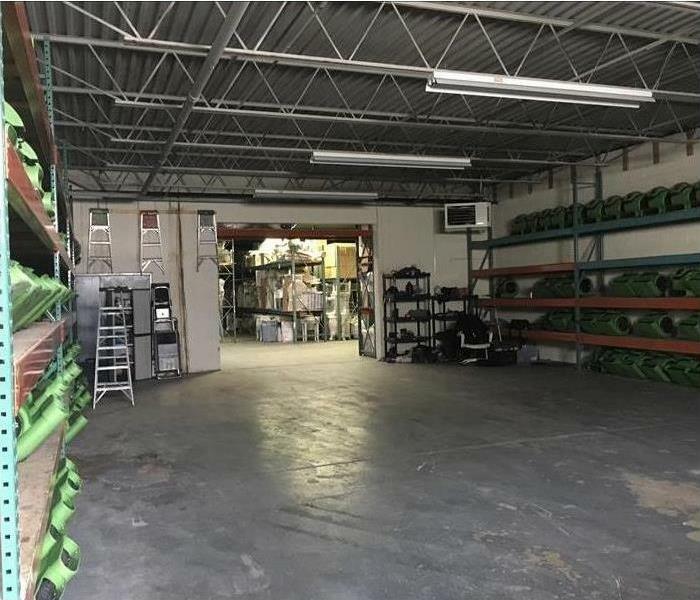 This 14,000 square foot facility is not just used to hold our equipment and tools but can be used to store customer belongings that need to be held in storage until mitigation/restoration is completed. 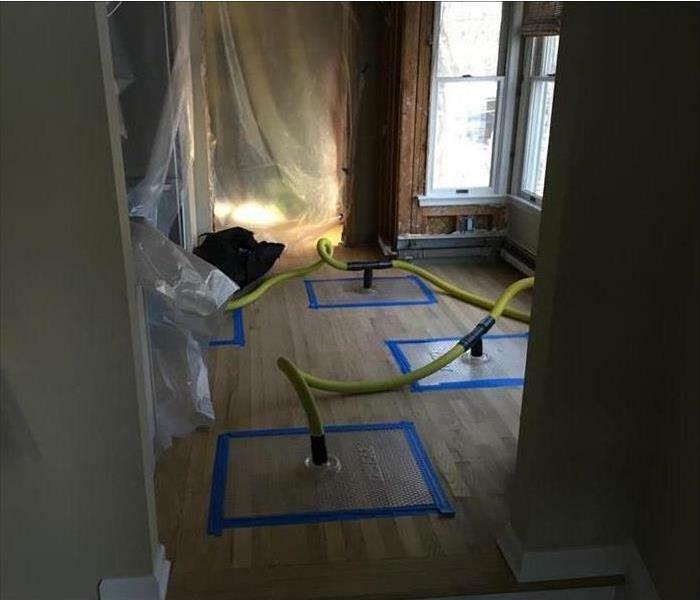 This water loss located in River Vale, NJ started in the second floor bathroom and made its way through the ceiling below and onto these hardwood floors shown. Our first priority was saving the hardwood floors with the use of drying mats. Our technicians set up containment to keep the nearby kitchen safe from debris. Check out our technician extracting water from this carpet with the use of a weighted extractor. Although tedious it is very good at getting moisture out. In fact it can remove up to 97% of water in carpet. 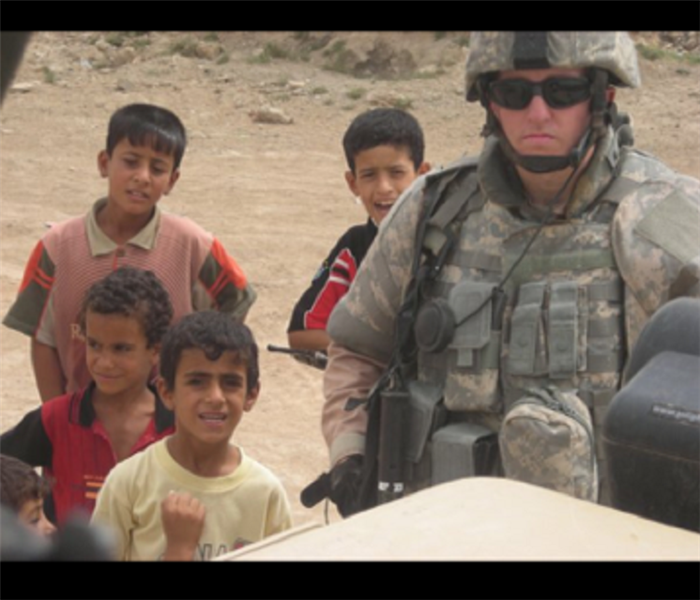 Sr. Airman Stevan Huff (Retired) during his 2008 Tour in Iraq. USMC Captain is greeted by his one year-old son after almost a year in Afghanistan. The sacrifices by our soldiers and their families can never be forgotten or taken for granted. Thank you Captain for your service. The SERVPRO of Paramus/Northeast Bergen County Production Team. Not just a team but a family. We are proud to have such great technicians working for our company. Hopefully you will never have to meet any of them but if you do just know you are in good hands. On Saturday I had the good fortune of taking my daughter to her first Yankees game. It was against the Red Sox, sold-out and a beautiful, hot day. The Yanks lost but I could not have had a better day with my daughter. 2 years ago when Derek Jeter retired, we watched his last game together at home. She turned to me and said "Great, now I'll never get to see him play in person". Now it's Brett Gardner, she saw him play AND he hit a Home Run. Janet and Tony working hard planning events. Your Fire, Water and Mold Remediation specialists at SERVPRO of Paramus. This picture was taken towards the end of a 12 hour day... a moment of temporary insanity for sure. I hate when the weather changes. Sometimes though, there's beauty in autumn. 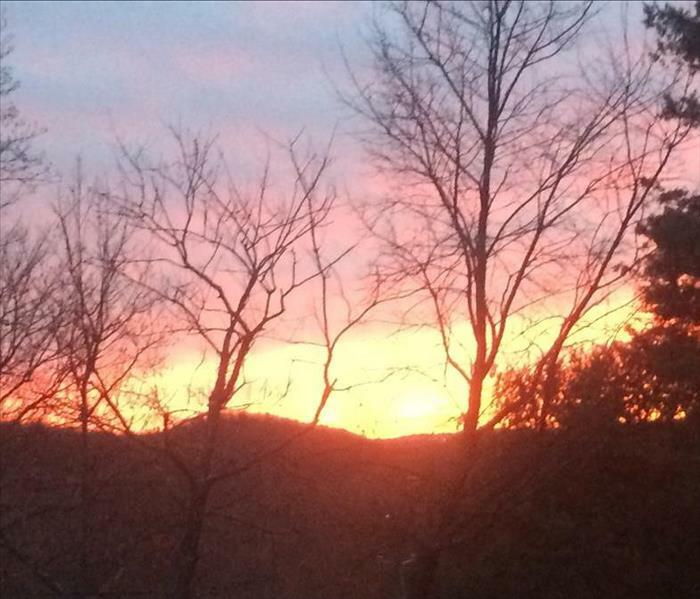 I took this picture off my front deck. The leaves are all gone and I can see out to the mountains. Sometimes you just have to take a minute and enjoy the things we usually take for granted.